Welcome to our website. 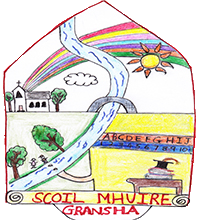 Scoil Mhuire Gransha is a very busy place with a wide range of activities taking place both inside and outside of the classrooms. We have tried to capture as much of this as possible on our site for your enjoyment. We also hope that it provides you with essential school information. If you need to contact the school please do not hesitate to do so.